I'm in love with Rafe's Kirsten Cut-Out Frame Bag. Isn't this bag absolutely gorgeous! So pretty, so shimmery, so Divaliscious! 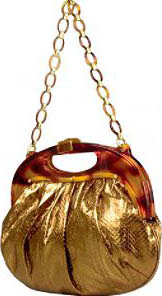 This bag comes in several colors, including black. However, at $475 this is one bag that would definitely break my bank account. Argh, why must you be so expensive, Kirsten!